What modern book would be complete without touching on the generational divide between millennials and their managers? As the parent of millennials and part of generation X with strong memories of hearing, “the problem with your generation,” I can offer a few insights based in work with clients. First, if you notice the differences, you can find the similarities. The idea that this giant, digitally native, socially connected, debt burdened, group has completely different priorities than you is not true. 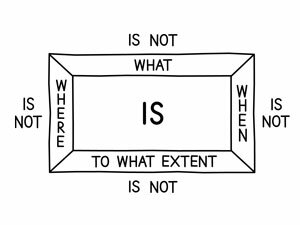 When solving problems, one of our exercises is Kepner-Tregoe’s “is/is not” box where we define what something is by giving equal thought to what it is not. We used a version of it with our fast decision playing field for planning. It looks like this Figure. Let’s apply is/is not logic to millennials in four parts. Most young adults don’t have money and historically have not had money. Most young adults communicate with their peers in different ways than with adults. Most young adults are interested in figuring out where they fit in the world and less concerned with preserving what they have gained. Your company, your strategic vision of the future depends on the next generation contributing their talents to your customers in a way that produces value to be shared. I have yet to meet a millennial that doesn’t understand that. Focus on what you have in common, not on the differences. Second, young adults want to apply their talents. Your job is to let them apply their talents to the outcomes your company is after. If this sounds familiar, it’s the focus of I in FIT, Individual Strengths. Train your people in applying their strengths to the tasks at hand. The idea that your young employees need to bring passion to their jobs is not a winning formula for you. Break them of that thought, and have them apply their strengths to their jobs instead. “This is the outcome we need because this is the vision we’re after, now apply your strengths to the tasks that need to take place in order for us to get there,” is what the language sounds like. When my daughter went to work in her first job out of college, every time she complained about her work or her supervisor, her grandparents would start in on the “kids these days,” commentary. That isn’t what I heard. I heard her manager struggling with giving her permission to apply her strengths to the work to be done. She called it micro-managing, but it sounded a lot like a manager who was less interested in outcomes than she was in how the work got done or in giving a reason behind why the work needed to be done. That is an easily remedied communication issue, it is not generational divide. Third, along the same lines as applying talents, is describing the vision. The companies that are listed as millennial friendly tend to have this one thing in common, they can describe an emotional vision of the future. The strategic vision of your future will help cross generational lines, but it won’t do it alone. As we learned in the previous chapter, there are multiple reasons why your people will buy into your vision of the future. It may be the vision itself, it may be a buy-in to the people you have on staff, or it may be buy-in to the customers you serve. Make all three parts of your business and your appeal to millennials will go up. Fourth, get bought-in to technology making life at work easier. We’ll go into more depth about approaching technology in the last section of the book, but your millennials and future digital natives will want to lead with technology. You need to acknowledge that technology is the answer to challenges or you’ll lose the tech savvy, but help them understand that technology only solves issues once you know where you want to go, and once you have applied your strengths to the tasks involved in getting there. It does not solve problems by itself. Another way of saying it is technology should make us more human in our quest to build value, not less human. My point here is that if you’re applying the process we’re outlining in The Human Being’s Guide to Business Growth, you’re going to have success with future generations of tech-savvy young adults. Just as I cringe when I hear myself say something my Dad would say, the youngsters are going to be last to know that they are more like us than they want to admit. Our job is to gently usher them along that path. An excerpt from The Human Being’s Guide to Business Growth by Greg Chambers, 2018.